The National Weather Service placed a High Wind Warning on parts of the Chicago area Tuesday, ahead of expected gusts that could reach up to 60 mph. In effect from 12 p.m. to 10 p.m., the warning was issued for McHenry, Lake, Kane, DuPage, Cook, Kendall, Grundy, Will, Kankakee and Iroquois counties in Illinois and Lake, Porter, Newton, Jasper and Benton counties in Indiana. Frequent gusts of strong winds could make driving difficult and may cause property damage, the alert said. 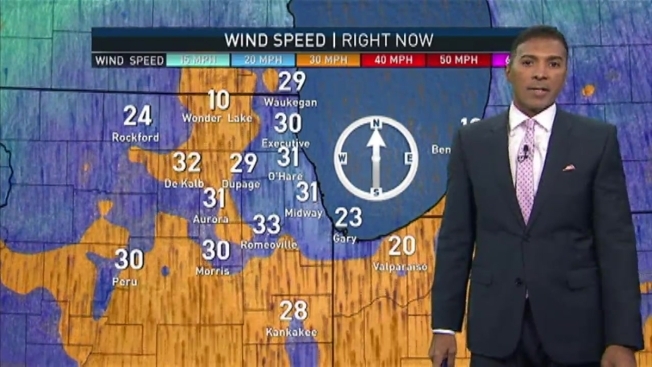 A Wind Advisory had earlier been issued for the entire Chicago area. That remains in effect for counties not under the High Wind Warning. As of 12:30 p.m., 37 flights had been canceled at Chicago's O'Hare International Airport. Tuesday will be overcast with periods of rain, becoming extremely windy and warmer throughout the day. Highs reach low to mid 40s, feeling colder with the strong winds, before temperatures fall in the late afternoon and night. Rain showers could end as an icy mix for a brief period in the evening, but little to no accumulation is expected. The strongest gusts will likely ease early, but the wind will remain brisk overnight, turning mostly cloudy and colder.